Trim not only video files but also all kinds of audio files. "I have a Mac and there is a video on it that I need to trim. I need to take a few seconds out of the beginning and a few of the end. Are there any Video Trimmer programs on Mac that does this? If so, how do I do it?" Whether you have a rather long video and want to trim it to the point that's important so that it can fit on your website, or want to shave it down to separate clips to upload to Youtube, you are going to need a reliable video trimming application to do the work. In this article, we will show you two reliable ways to trim your videos on Mac OS X. When it comes to trimming tools running on Mac system, we find there are very limited options for us to choose from. Sophisticated applications like Final Cut Pro or Adobe Premiere Pro are only available for video editing professionals to use, therefore there're even fewer options left for beginners, or average users to consider. Here we'd like to recommend the best video trimmer tool: Wondershare Filmora9 for Mac, which is considered as the best tool to edit YouTube uploads or home videos for users without any video editing skills. Besides being a mere video trimmer for Mac that enables you to shorten a video length easily and quickly, Wondershare Filmora9 also allows users to perform all kinds of basic editing as well as advanced editing work. Edit videos shot with any devices: AVCHD, Camcorder, iPhone/Android, DV/DSLR, Gopro etc. Shorten your videos or audio files can be easily done with three steps in Filmora9. Let's take a look at how to quickly trim a video file using Wondershare Filmora9 for Mac. Step1: Import media files to the media library. After you launch the program, find the "Import Media" butter on the upper left corner of the interface, click to bring up a popup window, there you can choose video clips from your local hard drive. Step2: Drag and drop the file that you want to trim to the timeline. When done, move the playhead to the beginning part or the end of your video, when you see an icon like : just drag the edge to trim the video as you wanted. This will enable you to trim either the front part or then end part. And then click the scissor button to first separate your videos into two parts. When done, drag it to the end of the unnecessary part likewise. Click the scissor button again. Choose the middle part and click the delete icon . Step3: If everything is ok, click the "Export" button to save your file. 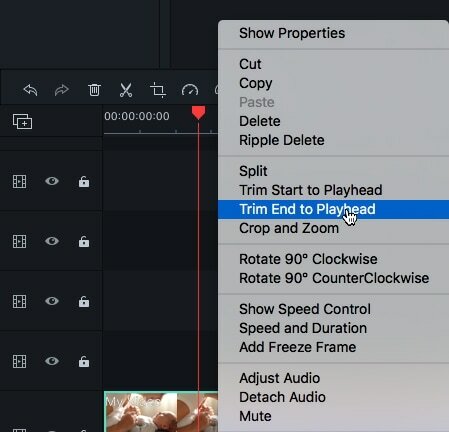 Filmora9 for Mac also feature a quick trim ability which allows you to trim start and end points with ease. After importing clips to the video track in timeline, press the Playback button in the preview window and zoom in the timeline to get a better trimming precise. Place the Playhead in the target position and then just right click the clip in timeline and then select the Trim Start to Playhead or Trim End to Playhead from the menu to get the parts that need to keep. Filmora9 for Mac (Latest Filmora version 9) Instant Cutter tool feature allows you to cut large video clips into several parts and then merge them into one video quickly without re-encoding. This tool is very useful when cutting and trimming large 4K videos and action camera videos. Step 1: Import the large video clips by clicking "Import with Instant Cutter Tool" and then you will see the Instant Cutter Tool window. Step 3: You can then trim the video clip with the In and Out slider or by setting the in and out point. For the detailed guide, you can check How to use the Instant cutter tool in Filmora9 for Mac to Trim and Merge videos. If however you will only need to simply trim an intro or end credits of a video clip, and won't necessarily need to do any further editing work, Apple's built-in Quicktime player is a good choice. It is undoubtedly the most underestimated Mac software Apple offers given the reason that except just for being a simple movie view app, it also allows you to do some very basic editing work such as eliminating needless parts of a video, joining or cutting your videos etc. A free version can be downloaded from Apple's website, there you will find a very detailed guide teaching you how to use its editing feature. Where the heck are the instructions? This software is not intuitive at all but the only "tutorials" I can find on this site are marketing videos to show off. No step by steps. And what I see in the videos is not at all what I see in the software. Come on you guys. I bet this is cool software but I can't figure it out and I'm a software developer so if I can't, I doubt anyone can unless they have more patience than I do. Maybe that's the problem.